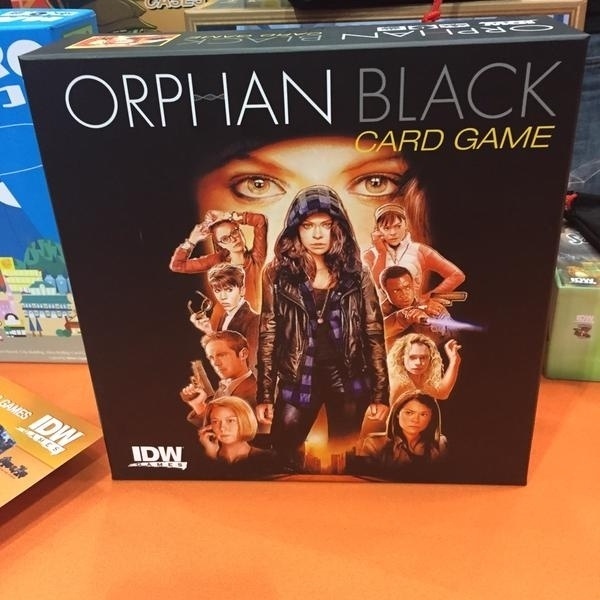 Orphan Black game coming this summer by the Bamboozle Brothers! Great review of Akrotiri by Naked Meeple! Mox Boarding House video review of But Wait There’s More! Mox Boarding House is one of – if not THE coolest board game store/restaurants I’ve ever seen. They have two locations, one in Seattle in the Ballard district and one in Bellevue. I’m hoping they find a way to pop these out all over the place (specifically Vancouver!). Well they have started doing video reviews and they are awesome! Is there anything that these guys aren’t good at!? 🙂 Check out this very entertaining video review for But Wait There’s More. Tom Vasel continues to praise But Wait There’s More! Tom already reviewed But Wait There’s More in a video, but he continues to talk about it in his podcast. Listen to the Dice Tower Podcast and at around the 11 minute mark you can hear Tom explain the game and why he thinks it’s a blast. He claims that it’s one of his top party games for 2014 and that it’s better than Snake Oil and The Big Idea! That’s some mighty praise – thanks Tom! You should be able to pick up a copy for yourself from your local game store. If not – tell them to order some in!! Here’s an interesting look at the development of a game – all through the changes made to the player aid! We’ll take you through the changes we made throughout the development of Akrotiri. There were more iterations of the game than just these because sometimes the player aid wouldn’t change but something else would. You can read the full story in our Akrotiri Designer Diary Part 1! Our first player aid came about 5 iterations in since we didn’t need them before this point. In this version players could have multiple ships! This stayed in the game for awhile, until we realized that you can move so fast in this game that multiple ships weren’t really needed. We had huts which were a way of claiming islands – but they didn’t have to be located like temples are now – you simply sailed to an island and built a hut! The market was more of a stock market concept where players could affect the price of each good. It took us awhile to figure out the current market as we were toying with other market mechanics. Pirates! We had pirates! You could move a pirate ship for an action and it did various things throughout the development…I think they could block you from even moving into a certain area – or they would steal resources from your ship! This version of the game was all about shipping resources – that’s it – so pirates were a way of creating some tension. This is where we implemented the temples! They started off pretty easy – like “East of 2 Mountains”. Apparently we allowed people to buy a lot of map cards as well! Makes sense that we reduced that to a maximum of 3 in the final game! The market was still a stock market style system. 1) We tried different capacities for shipping. You could upgrade your boat so that it could hold more resources. It’s not a bad idea but meant more components since they’d physically have to actually hold that many resources! 2) You could place a flag on an island! Weird. You got points for flags on contiguous islands – but you couldn’t place a flag on islands with your opponent’s flag. This did add an element of interaction as you’d be racing to get to specific areas before opponents so you wouldn’t be blocked off. Then you were motivated to place your tiles in your area more to make more islands…so by the end it actually did the opposite of interaction since each player was in their own sector of the map. Things we added that stuck: Gaining more actions based on the number of temples you’ve found. While the number of actions changed through each iteration – the concept stuck! It really motivated people to build temples fast! But once you got one or two – it was tricky timing when you should find a harder temple – and that decision still remains in the game. Another thing that stuck: Different levels of difficulty for temples. The point values changed a bit, but the fact that we had three levels of difficulty stayed until the final game. In this iteration we gave bonus points for temples that were built further away from the main island of Santorini (Thera in the final game). The idea is interesting and it made it into the final game but only as goal cards. Wow – looks like we had a lot of temples in this version! Interesting that the actions go up and then back down. That was our idea of a negative feedback loop (catch-up mechanic) as you had to time it right when you wanted to build those last few temples. Ultimately we found it anti-climactic and had it only increasing in actions. Another stab at doing the market. This time each player would have a token for each resource and would place it on their own player aid. I can’t remember how players would impact their own market – but since it was individual, it just didn’t work. You can see some things starting to take fruition – like how to excavate temples. That’s exactly how it is in the final game – except that now you can excavate on any tile, not just the one you placed. The Worshippers were the same things as the flags in the previous versions. A way to get other points. 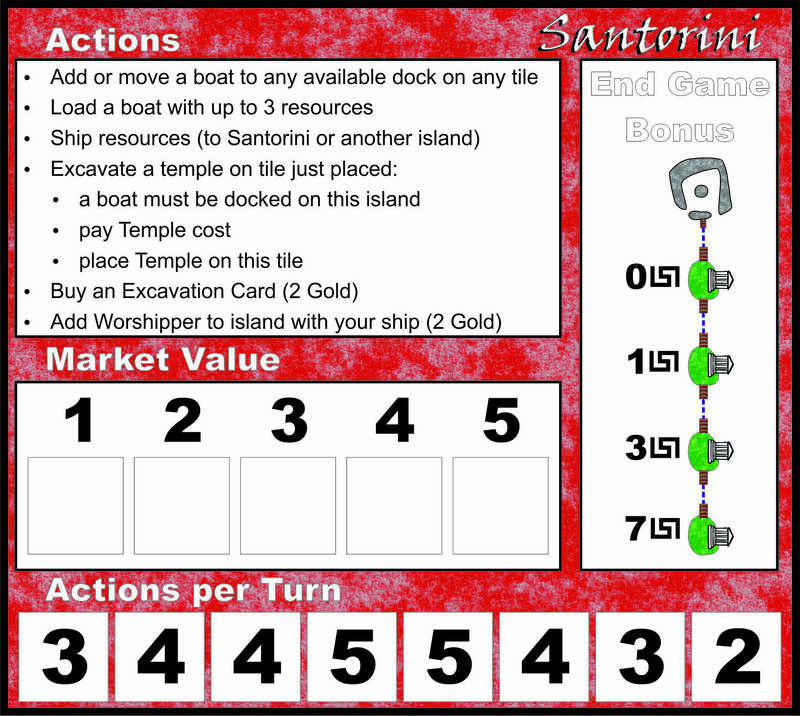 This one added back the bonus for finding temples further away from Santorini as well as the flags/worshipper bonus. The star at the end of the Actions track meant the game was over. The game has now changed from Santorini to Akrotiri! We saw that there was already a game on BGG called Santorini so we changed it to Akrotiri – which is an archaeological dig site on the island of Santorini. 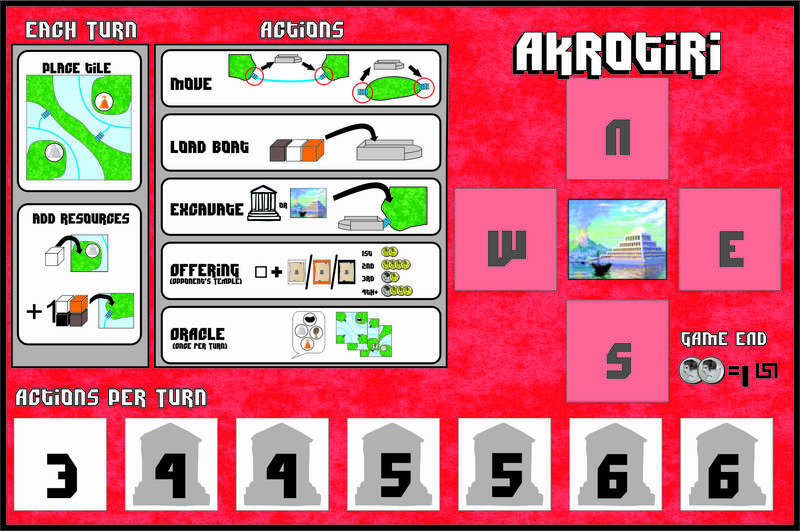 1) Added the pre-turn actions to the player aid: add a tile and place 2 resources. 3) Atlantis! What?! Yeah we added this whole other element of Atlantis. Many people believe that the volcano that erupted that created the island of Santorini also sunk Atlantis! So we thought we’d use that in our game. 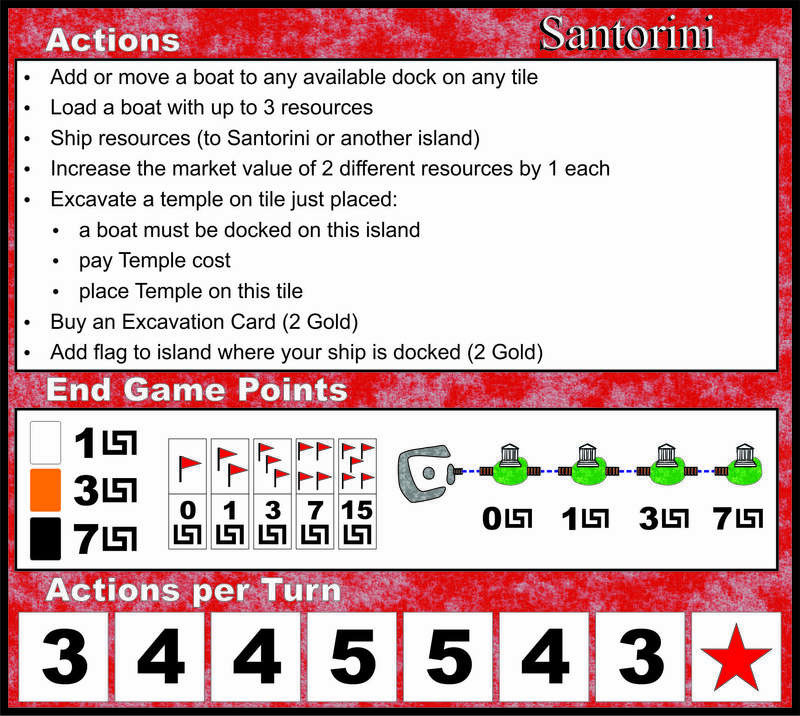 Basically in this first version of having Atlantis in the game you just used one of your map cards – but you paid 12 gold and it only gave you 3 points – but it ended the game. Atlantis will stick around for a few more iterations…! Check this out! Now we’ve got a pretty fancy player aid! Everything has been turned into a graphic or an icon! Pretty sweet! 1) Pick a role? Yeah we had these different role cards that gave bonuses and made certain things easier. You would choose a new one each turn. 2) The actions are very close to the final version of the game. There’s no oracle yet (that was one of the roles!) and maps cost 2 gold each instead of being able to buy more for one action at a higher price. 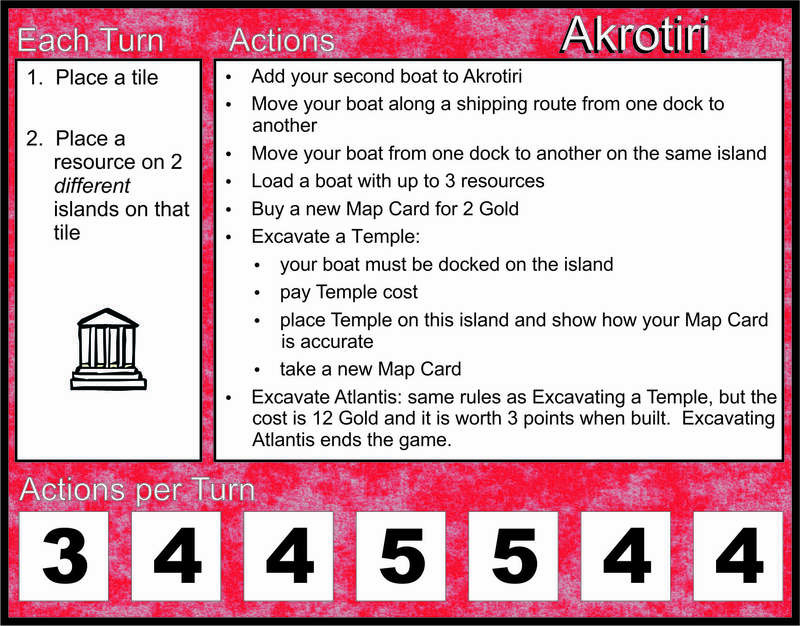 3) Game ended when Atlantis was found or one player found 7 temples and 5 gold gave players a point at the end. This is the version that was first pitched to Z-Man at BGG.con in November 2010. This one had Atlantis still but now you had to find rumours in order to locate Atlantis! Whenever any player every found a temple, they would take a random rumour token and place it face down on top of the temple. Then any other player could go to their island and pay the owner of that temple some gold and get the rumour token. That player would place the rumour token face up on one of the ordinates on their player aid around Atlantis. The rumour token would have terrain icons on them and once you got a rumour token on all 4 ordinates (N,E,W,S) then you had a map to where Atlantis was located! Whew – crazy! Also the Oracle makes an appearance! It even took more actions to use the Oracle the further you were along – which seemed fair! 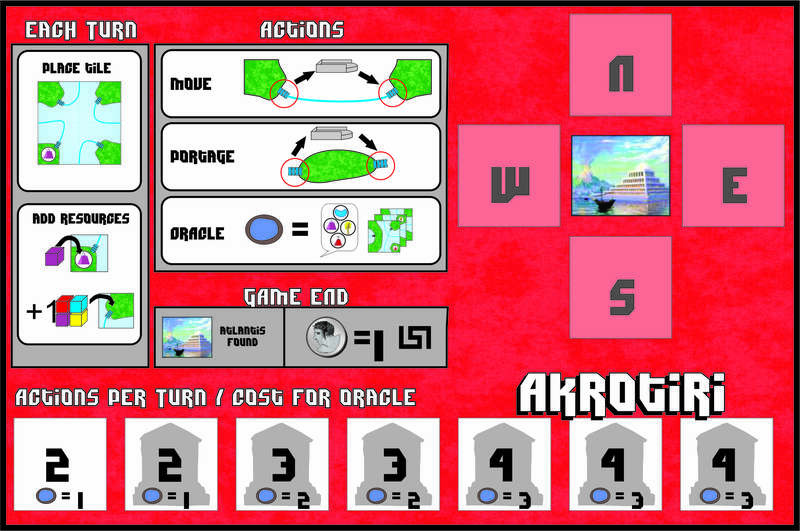 We also implemented the concept that your actions per turn only increased. This version had something called Offerings and for the life of me, I can’t recall what that was about! It seems like it was something about rumour tokens. Yeah – you would get more money for each successive rumour that someone bought off of you. This meant players tried to find rumours from players that hadn’t ‘sold’ many yet. We also tweaked how many actions you could get per turn.The end game gave 1 point for each 10 gold – which is how it is in the final game. OK bye bye Atlantis. Maybe we’ll see you in an expansion one day! We had received feedback from a different publisher that the Atlantis part felt tacked on – which it really was – so we removed it. We added the ability to buy more map cards for one action at a higher price. This is pretty close to the final player aid. We even added the free actions on this one. The one change that was made after this was to make it a two player game and to add more goal cards to some of the action spaces. So that’s it! A tour of how a game came to be, as seen through the perspective of the player aid! 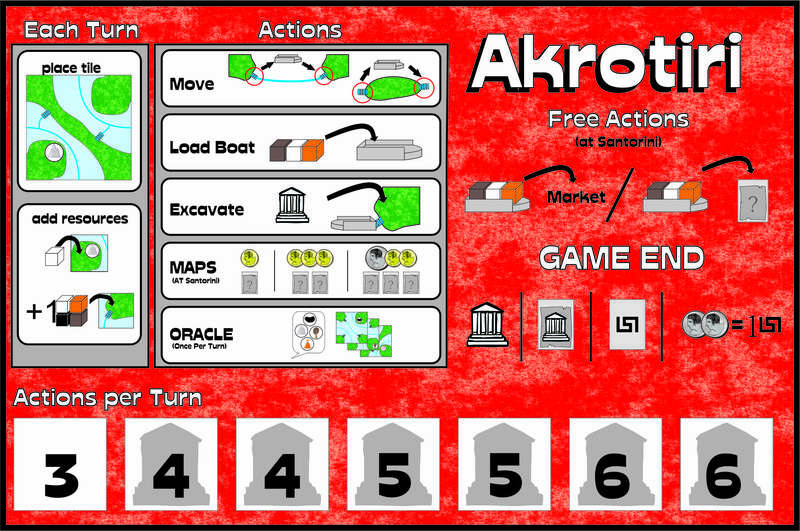 Jay and Sen take a look back at how Akrotiri came to be! Jay: Let me start by saying that Akrotiri is my favourite game that I’ve had a part in designing. I really love tile laying games and I love the unique mechanic that we came up with for the game. 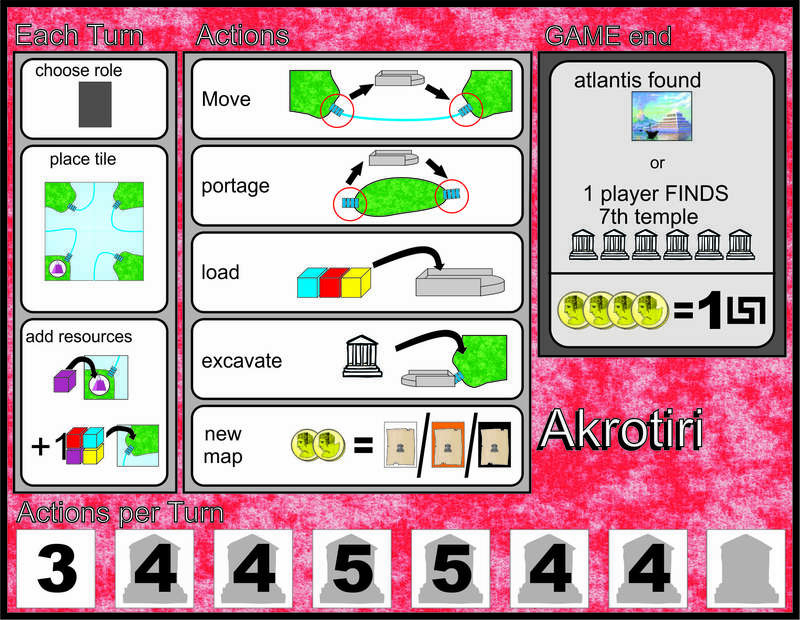 Though we’ve had other games published before this, you could say that Akrotiri was our very first game design ever! When Sen and I decided to design games, we started to make a tile laying game about trying to find treasure in a jungle while avoiding natives. Sen: Jay is a *huge* Indiana Jones fan so our first attempt at making a game naturally centred around a theme we knew well. Jay didn’t just want the players to find a map, he wanted them to find a map from combining random pieces. The trick here was that those random map pieces still had to make a usable map that would help the player locate treasures on an ever-changing map. Jay: Yeah! So, these map pieces would say things like “Two paces north” or “West of a tree,” where the player could then triangulate the location of a hidden treasure based on location relative to landmarks and such. Sen: We were on to something with that mechanism, but we couldn’t figure out how to make the *rest* of the game fun. Jay: So, like many people, we kind of gave up. We’d talk about it less and less when we hung out and then eventually stopped talking about it altogether. Fast forward a few years and I had to move to the west coast of Canada for work. Sen: We thought that making games together would be a great way to stay connected despite the distance between us, but we were so focused on new titles that we completely forgot about that first game. Jay: Now, fast forward a few more years to 2010. Now, we have a few games designed and we’ve successfully signed our first two games (Belfort and Train of Thought with Tasty Minstrel Games). We’ve been using this 25-tile restriction concept to help us get games to a playable point faster and I had started to work on another small 25-tile game as a gift for someone. It was originally called Smokeboat because players were boating from island to island picking up meat and smoking them. 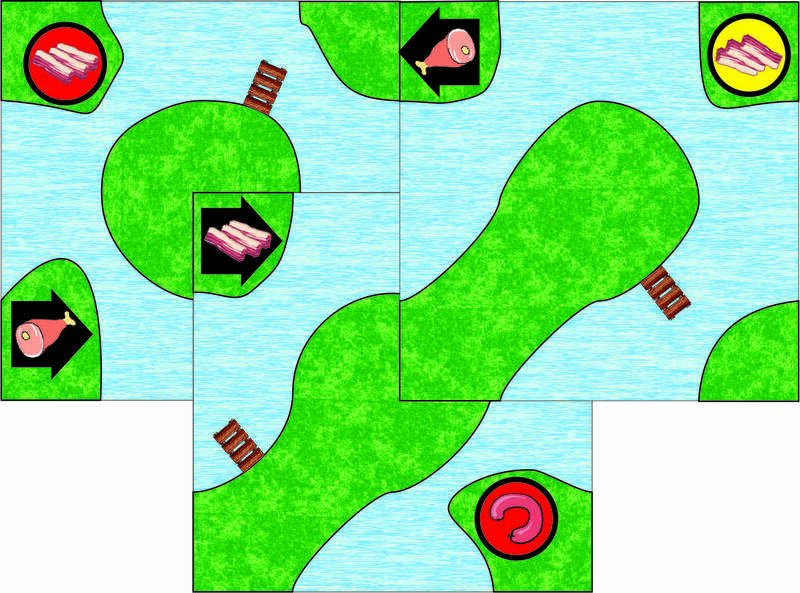 Jay: In the first version of the game, players were supposed to lay tiles over 1/4 of another tile, which would create unique islands and pathways. This seemed really interesting at first but, upon playtesting, it became obvious that it was just too hard to figure out where to place your tiles. Sen: So we removed this aspect and the game changed to a much more conventional and, thus, accessible tile laying game – instead of the Carcasonne rules of placement where you had to match similar aspects from one tile to the next, we put all the land in the corners and made the pathways vary on each tile. It was the pathways, or trade routes, that would vary but a tile could be placed and fit on any position on the map. Jay: Yeah, it was more based on how you wanted the trade routes to line up that mattered. The game started out as a basic “pick-up-and-deliver” style game with the goal being about making as much money as possible. We fiddled around with it like this for a while, but it lacked that special spark. We did come up with a more interesting way to do movement though. Instead of a 1:1 movement where you count how many tiles you can go, you travel from dock to dock. Sometimes this might take you to an island that’s located on the exact same tile that you’re already on, but most of the time it will take you halfway across the board as you aren’t forced to stop at every dock you pass. This made the traveling part really quick and interesting. Sen: Sometimes an island can get cut off from the trade routes, so we allowed players to portage from one dock to another – on the same island. This opened up the board and solved the issue of getting a blocked board! We also had pirates! They would steal resources if you sailed past them. They weren’t that interesting so maybe we can find a way to save them for an expansion! Now, for some reason, we stumbled back upon the idea of borrowing the mechanic from our very first game that we never finished – the random treasure map on a random tile map. Surprisingly, this worked out extremely well with very little alteration! Our tiles already had terrain icons on them to dictate resource availability per island, so we based all our maps around the terrain icons. Now a treasure could be located south of a mountain and east of a volcano, for example. 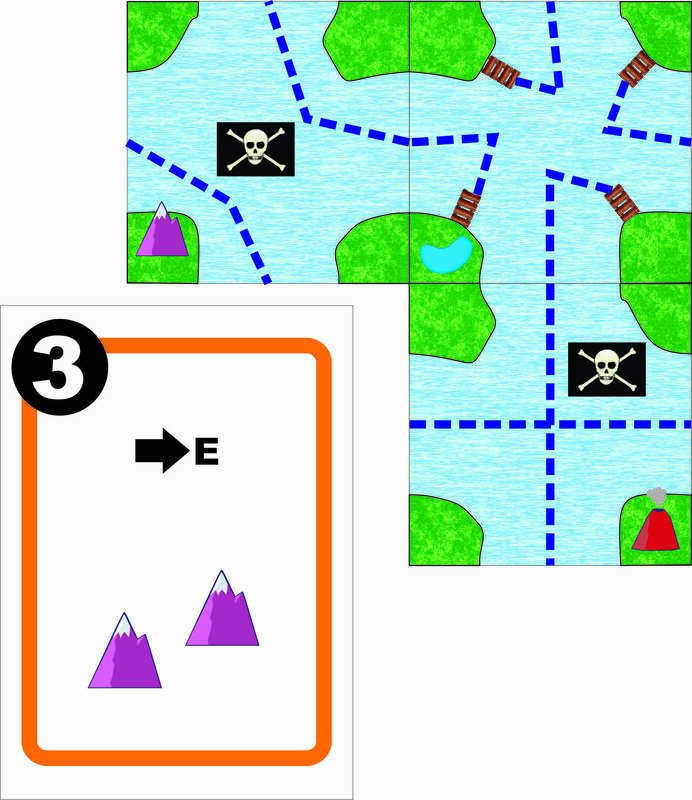 Players were now placing tiles in order to create a world to make their map cards playable. At the time, we had never played any other game quite like this. 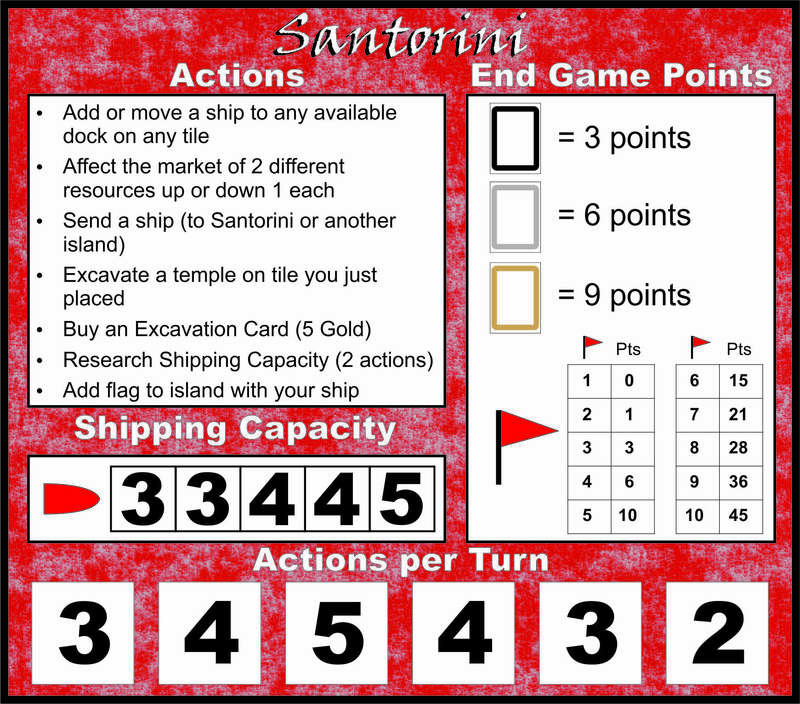 Jay: We decided to set the game in the Greek islands and called the game Santorini after the famous Aegean island. As we refined it, we wanted to create a believable reason for the whole “shipping in the Mediterranean” portion of the game. We created the backstory that players were not mere merchants but explorers who needed to dabble in trading goods to fund their expeditions. We learned that Santorini exists due to a volcano erupting and thus creating that island. Bringing your resources back to Santorini to sell made a lot of sense since they weren’t capable of growing their own resources. 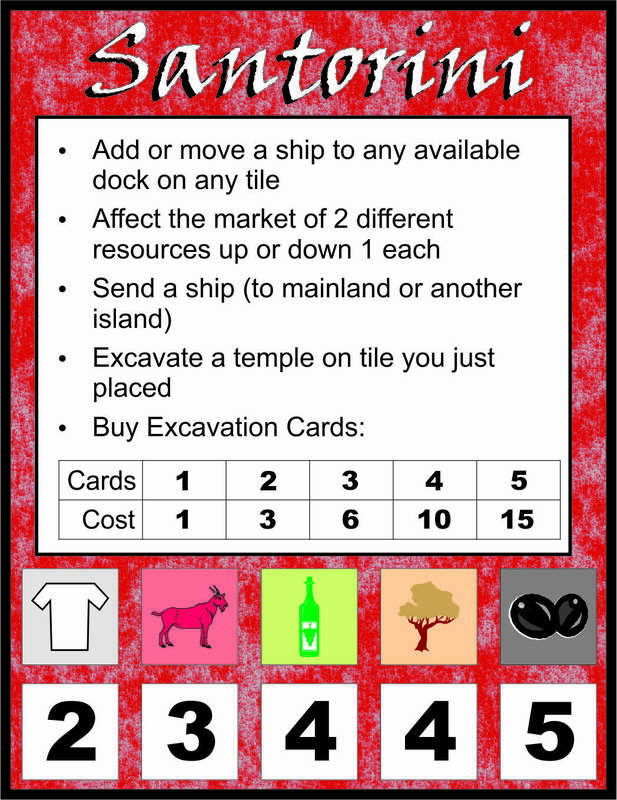 One of our first attempts at the market where players impacted the cost of goods with specific cards. Not as elegant as our final solution! Sen: We tried a bunch of different ways to make the market interesting and we ended up with one that players can affect in small ways, and one that also increases over time as the game ramps up. It was a stroke of luck that the market we use also matched the pace of our game! We also changed the hidden treasures to lost temples that needed to be excavated. 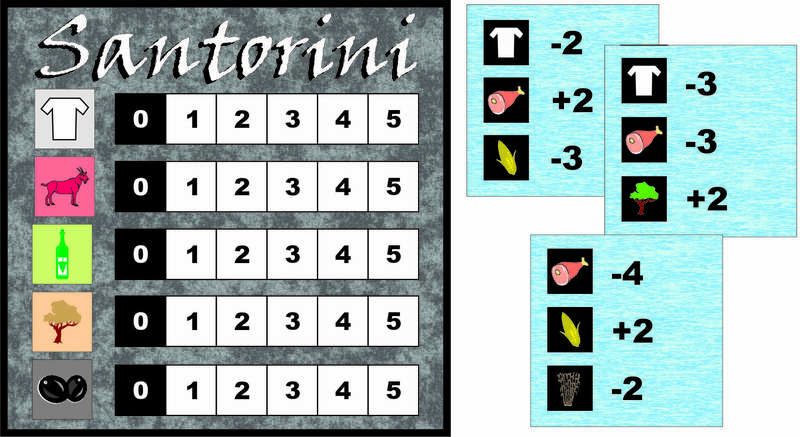 When we checked http://www.boardgamegeek.com, we found that there was already a game called Santorini, so we changed the name to Akrotiri. That’s the name of an archaeological dig site on Santorini itself, and Santorini is also known as the island of Thera – it’s all a bit confusing, really! On the right side is Atlantis and players would have to find clues or rumours about the location of Atlantis in order to win the game. Another expansion idea mayhap?! Jay: So we had our name and we had our mechanisms. The game still lacked a strong narrative arc and we couldn’t figure out a solid end game. For the longest time, the game revolved around the players finding to find Atlantis. The volcanic eruption that formed Santorini was reputed to have also sunk Atlantis. We had players sailing around to the islands, finding temples using their map cards, all while collecting clues to where a gateway to Atlantis was located. Sen: When a player found a temple, she would place a random rumour token under it. So then, the other players would sail to their opponents’ temples trying to collect these tokens to be the first to find the gateway to Atlantis. Jay: There were so many other ideas that were tested with this game. At one point we had pirates that players controlled that would steal resources from you. We had flags that you placed on islands to claim them – which gave players different abilities than placing a temple did. We had meeples at one point too – I think they were priests that you would deliver to the temples for a benefit. 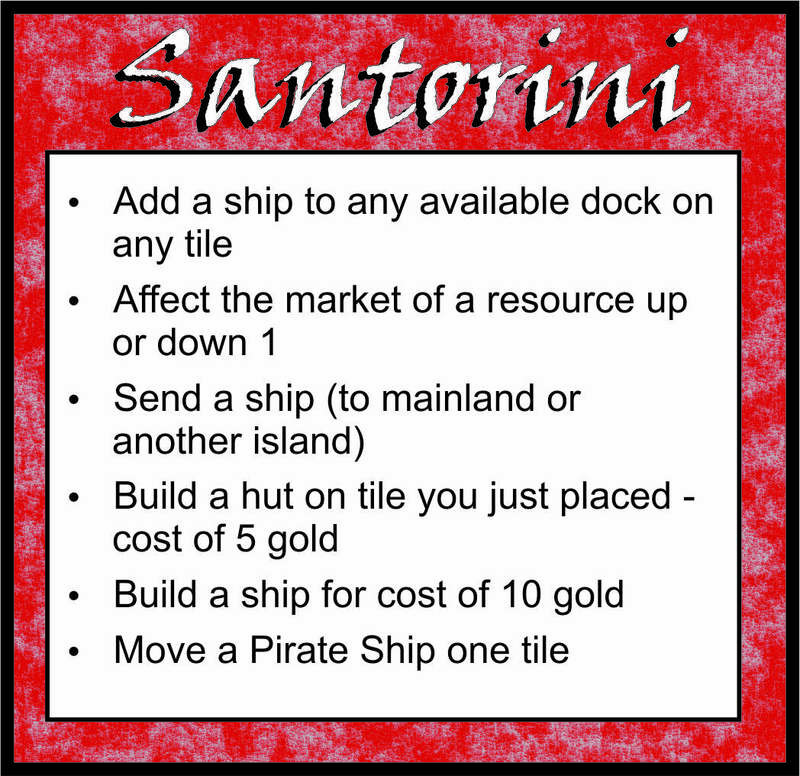 There were contracts in the game at one point too – where you could fulfill by delivering a specific set of resources to Santorini to get points- but not many people ever did that because it was more fun to use resources to gain money and use that money to find temples! Sen: We had huts on the islands for awhile which gave players more actions – but eventually we streamlined that by giving players more actions as they excavated temples. For a long time players could buy more boats and the boats had different attributes like speed and capacity – but that all was unnecessary as we found out through our playtesting when everyone pretty much focused on just one boat most of the time anyway. We had role selection in the game at one time too – with each role giving the player a specific bonus that round. That might be good for an expansion! With all the pieces in place, Jay pitched the game to Z-Man Games at BGG.con in 2010. Zev liked it and took it for further review. Jay: Then the waiting began. We heard nothing back for a long time; months, really. Then Z-Man got bought out by Filosofia. This caused some delays so, wanting to be transparent and wanting to place the game, we asked if it was okay for us to send Akrotiri to another company. Quined, a Dutch publisher, had expressed interest in seeing it and we didn’t want to miss an opportunity. Zev was amenable to that and so we sent another copy of the prototype to Quined. Sen: After some time, Quined got back to us. They said they liked the game, but felt that the whole “Quest for Atlantis” aspect of the end game was tacked on, so to speak. In retrospect, it, in some ways was. We discussed modifications with their team, but they still decided to pass on it. Jay: But did that deter us? No! It gave us further motivation to figure out how to end the game properly! After tinkering with it for a couple months, we realized that the game should really just be about finding the temples so we stripped away all of the Atlantis references. This streamlined the game immensely, which just goes to show you that rejection can be a good thing because it helped us transform a game that we really liked into a game that we loved! Sen: We sent the new version of the game to Filosofia for them to test and they liked it. 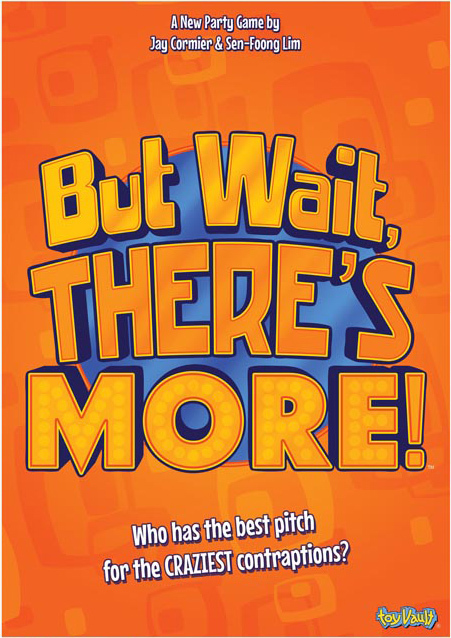 The only challenge was that we originally pitched the game for 2-5 players. We had tested it under those conditions and it held up in all regards. Sophie from Filosofia was adamant, however, that the game would only be signed as a 2-player game. Her position was that there was too much down-time between individual turns with larger player counts. We conceded, agreeing that Akrotiri would make an excellent 2-player game. Jay: And so, we signed on the dotted line! 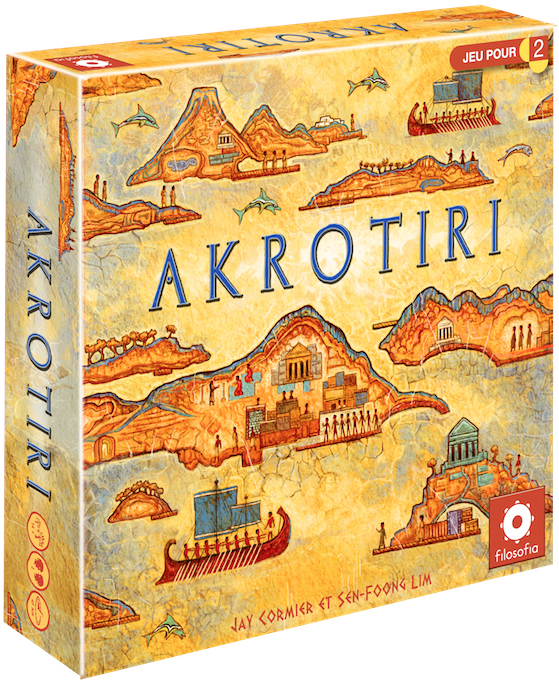 Needless to say, we’re extremely excited that the gaming world is finally be able to experience Akrotiri! Next up we’ll take you on a tour of how the player aid changed throughout the development of Akrotiri!